Built for industry, but perfect for home. A bit on the industrial side? Perhaps, but if reliability is what you really want from your smart lock, the Schlage Sense should be your top choice. The Schlage Sense is an enormous piece of equipment (the interior escutcheon alone is eight inches high), and installation can be a bit of a headache. One gets the sense that this is a product primarily designed for contractors and homebuilders to install, judging by a pair of dense instruction manuals that must be followed to get the not-wholly-intuitive Sense affixed to your door. (If printed instructions aren’t your bag, some seemingly helpful how-to videos are built into the app, but I couldn’t get any of them to play with audio.) It’s also worth noting that this lock is certified as commercial-grade, not merely residential, which instills even more confidence in its operation and build quality. 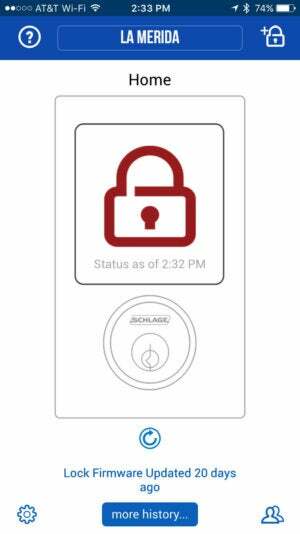 Editors’ note: This review, originally published August 3, 2017, was updated on May 8, 2018 to report that the Schlage Sense’s Alexa skill now includes the ability to use voice commands to unlock the deadbolt.The feature is disabled by default. To enable it, users will need to log into their Alexa app and create a unique PIN that must be spoken to perform the action. Potential installation woes aside, once the Sense is up and running, it’s a solid performer with unparalleled reliability in this space. 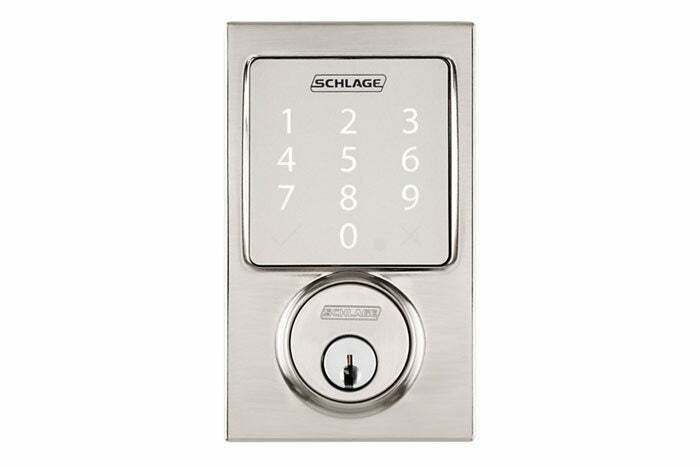 While many smart locks frequently jam or choke at the tiniest hiccup, the Schlage Sense worked impeccably in my testing, never once failing to open or close on command. With the app installed you can always tap an icon to unlock the system, or on an iPhone you can use Siri if you’re within Bluetooth range. The lock is fully HomeKit-enabled, so if you have an Apple TV, you can check the lock status and issue open/close commands remotely. Note however that Android devices are not supported at this time. Schlage’s app logs all of the Sense’s activity. Standing in front of the door itself, you can open the lock via a physical key or by tapping a code on the smudgeproof, illuminating numeric touchscreen keypad. You use the app to assign up to 30 different PIN codes, each of which can be restricted by schedule, so you can give a limited code to your housekeeper and unrestricted codes to each member of the household. If the housekeeper quits, you just disable the code. Whether this is a better solution than a system that doesn’t offer a keypad is up for debate, but it is worth noting that every users’ PIN must be the same length. So if you assign one user an 8-digit PIN (the maximum length), every user’s PIN must be 8 digits long.Full logging, of course, is enabled within the Schlage app. The lock adds two additional features to the mix. First is auto-locking. This isn’t a geofencing system but is rather a simple timer. If you want your door locked at all times, you can tell the Schlage app to auto-lock it after anywhere from 15 seconds to 4 minutes. Second is a rudimentary alarm system. The lock can be configured to beep when the door is opened or closed (much like a standard security system might do), or you can set an alarm to go off if an attempt at forced entry is detected—and you can decide its sensitivity level. No smart lock is perfect (yet), but if you’re looking to upgrade today, the Schlage Sense is the device to beat—especially if you have an Amazon Echo or live in a HomeKit environment. Editors’ note: This story was updated to correct our reporting of the maximum number of digits you can use for a PIN.